Georgia O'Keeffe first learned about Texas as a child while listening to her mother read stories of life in the Wild West. She experienced Texas for the first time when she accepted the position of Art Teacher at Amarillo Public Schools from 1912 to 1914. She continued life on the Panhandle Plains of Texas at Canyon, Texas' West Texas State Normal College from 1916 to 1918. "There is something wonderful about the bigness and the loneliness and the wind...Texas is my spiritual home." 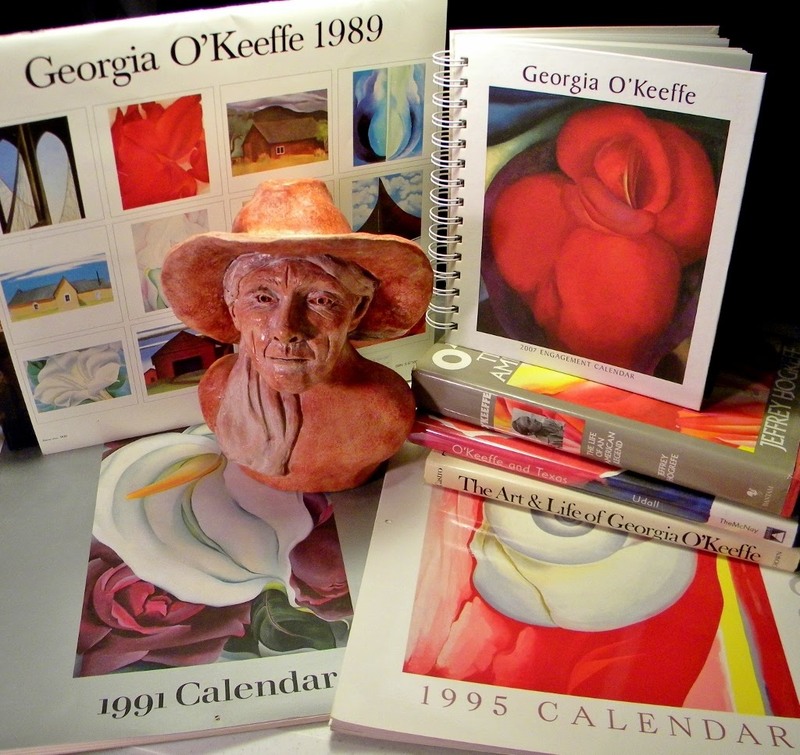 Georgia O'Keeffe had a major impact in my pursuit of a Masters of Art Education in the late 1980's. Her influence both in painting and three dimensional mediums inspired my O'Keeffe Collections of books, thesis, posters and calendars. For many New Years, an O'Keeffe Calendar hung in my School Art Room and in my Home Studio. I have been fortunate to see many of her paintings in person at the Dallas Museum of Art, and the Georgia O'Keeffe Museum in Santa Fe, New Mexico. The Santa Fe Museum opened in July, 1997, eleven years after her death. I visited the museum during the first week it was open. The O'Keeffe Museum houses the largest permanent collection of her work in the world. 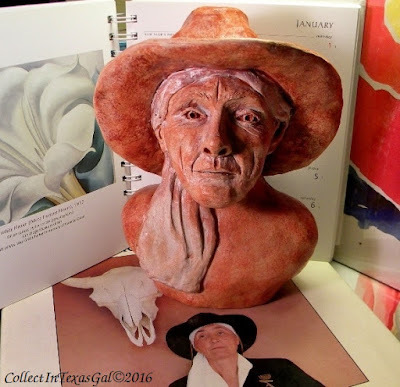 The Bust of Georgia O'Keeffe...by yours truly. 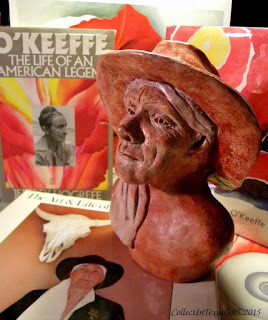 Georgia Totto O'Keeffe was born November 15, 1887, in Wisconsin. She died March 6, 1986 at the age of 99 years in Santa Fe, New Mexico. She is recognized as the "Mother of American Modernism". I always liked the photo of her hands taken by Stieglitz. She was a woman who exuded great character. Glad you mentioned that photo. A favorite of mine as well..."Hands and Thimble" by Stieglitz in 1920. It is in "The Art and Life of Georgia O'Keeffe'. She was his favorite subject to photograph...her extraordinary character was portrayed in his photos and in her paintings.